Here launches a three-part, week-long miniseries on Shusaku Endo’s eminent novel, Silence, about a Portuguese missionary in religiously repressed, 17th century Japan. The priest, Sebastian Rodrigues, in a paradoxically doubt-rife and no-less-gracious way finds his wayward trail to his own Calvary and, accordingly, into the very heart of God. The sea only stretches out endlessly, melancholy and dark, while below the grey clouds there is not the shadow of an island. There is no change. What does it mean when we pray to no avail? When we call on God and there is no change? What is this cruel silence? How can God be love and be silent? Father Sebastian Rodrigues prays faithfully to God and finds no answer, just silence. Just the dark sea, a grey perpetual beating upon the shore, an unremitting reminder of what is not being said, the interventions not being made. It is not even that the silence of God is depressing; it is depressing that this silence is so elementally nonchalant. Upon his arrival to strange Japan, he is assaulted with the hiddenness of Christ. Like Graham Greene’s whisky priest, Rodrigues is stripped of what trappings would designate his priesthood–his sacraments, his church–and left to lead a life hidden. Burrowed in the forest hills of a small farm village, his ministry consists of sitting silently in a shack until nightfall, when one or two farmers will venture up to bring him food and to give confession. He quickly finds himself mired in depression. His priesthood shed of the dignity of the freedom it proclaims, shed of the freedom to proclaim, the Christian life becomes one hidden in the dark agony of mystery. And he still cannot understand why his mentor, his inspiration, Father Christovao Ferreira, a well-respected Portuguese missionary to Japan for 33 years, so ambivalently recanted his faith under torture. Having hoped to come to Japan to atone for his mentor’s earlier apostasy with his own self-giving ministry and martyrdom, he finds no such Christian glory. 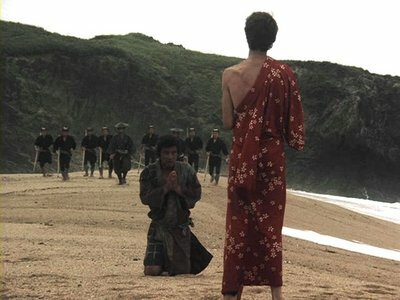 Instead, upon the Japanese government being informed of his arrival, Rodrigues must witness the martyrdoms of the Japanese farmers who refuse to reveal him. They are strapped to wood and laid at the sea’s shore to slowly drown. Though remaining hidden has brought on guilt for Rodrigues, his deeper agony is not the drama of their martyrdoms, but the dreary tedium of their deaths, like the repetitive waves hitting shore, and God’s long silence. How can God not intervene? They were martyred. But what a martyrdom! I had long read about martyrdom in the lives of the saints—how the souls of the martyrs had gone home to Heaven, how they had been filled with glory in Paradise, how the angels had blown trumpets. This was the splendid martyrdom I had often seen in my dreams. But the martyrdom of the Japanese Christians I now describe to you was no such glorious thing. What a miserable and painful business it was! The rain falls unceasingly on the sea. And the sea which killed them surges on uncannily—in silence…I myself to do not quite understand. Only that today, when for the glory of God Mokichi and Ichizo moaned, suffered and died, I cannot bear the monotonous sound of the dark sea gnawing at the shore. Behind the depressing silence of this sea, the silence of God… the feeling that while men raise their voices in anguish God remains with folded arms, silent (60-61). The repeated juxtaposition of glory with silence is an intentional one for Endo, and one he employs throughout the novel. Rodrigues has only known the God of Glory until he sailed for Japan—he now finds a God “hidden in the swamp” that is Japan. He is not prepared to fathom the hiddenness of God, something that seems to fascinate Endo in its rendering of the paradoxical nature of the Incarnation, of God Come Down. Endo, most likely because of the uncommonness of being both Japanese and Catholic, draws a stark contrast between the God of Trumpets in Paradise and the Word Made Flesh. In the Incarnate God, the omnipotence of God is relinquished, surrendered to the fragile and suffering and wounded human form. Endo here seems to be pointing out that God is silent only because God is pointing at suffering and death as the means to life. The “wounds which mar the Chosen One” are still wounds before the disciples after Easter. Jesus Christ, Endo points out through God’s dark and monotonous waves, is not God’s demonstrated end to suffering, but God’s demonstrated suffering with. The silence is broken, but not until the appointed time. After countless prayers left unanswered, after being imprisoned, after the assurance of martyrdom, God’s suffering with speaks to Rodrigues. Knowing he will be asked to perform the fumie, to step on the icon of Christ as a signifier of his apostasy, he has even in the silence of God decided to remain true, to be the glorious and faithful martyr he set out to be—until Christ speaks up from the plaque of apostasy. ‘I was not silent. 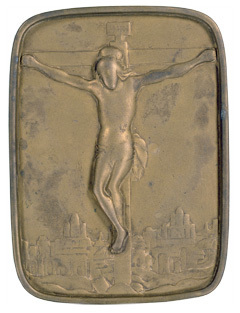 I suffered beside you‘ (190). I absolutely love this book, and look forward to reading your next couple posts! It was one of the most devastating, challenging and complex books I read during undergrad. I remember getting into some spirited arguments in class about Rodrigues’ decision after we finished the book. Also, I’m very excited to see what Scorsese does with the film, which I think is coming out in the next year or so.